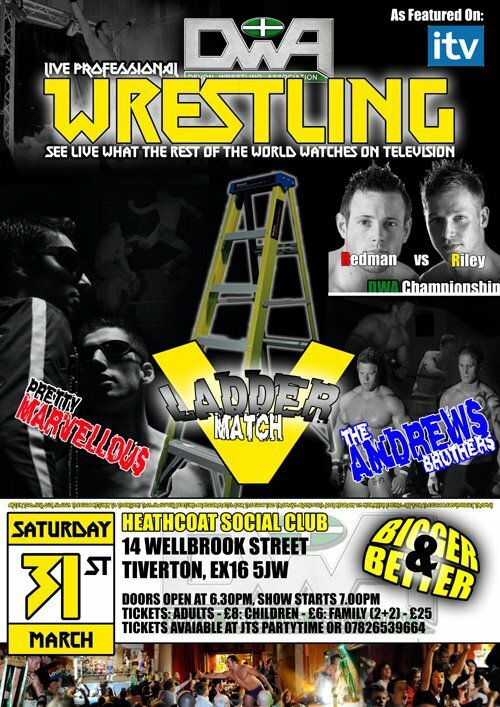 Devon Wrestling Association’s “Ladder Match Mayhem” – March, 2012. SuperKick Media is proud to announce that it was chosen by the DWA to produce the DVD of their latest show, entitled “Ladder Match Mayhem” and filmed before a 200+ capacity crowd at Heathcote Hall, Tiverton in Devon. It’s a truly fantastic show featuring some of the best names in British wrestling today, not to mention a selection of up-and-coming ones to watch. This event has something for everyone; kicking off with a star-studded 8-man-tag, it brings a good mix of matches including tag, singles, and 3-way dances culminating in a double main-event. There’s also a healthy dose of comedy thanks to the likes of Mad Man Manson and “Professor” Gilligan Gordon. The first main event sees the WWE’s newest signing, Joel Redman taking on reigning DWA Heavyweight Champion, Nick Riley for the title in one of the hardest-hitting and most emotional matches in DWA history. Both competitors go all-out in this traditional, World of Sport style match, fought over a series of rounds to decide the winner. The second main event of the evening was a brutal ladder match between Pretty Marvellous and the Andrew Brothers for the Tag Team Championship. It was an incredibly well fought match, a mixture of raw power and style. There can be only one winning team, but both teams go home battered. It’s one not to miss. The DVD is still quite some time away from a general release, but here’s a sneak preview trailer of what’s still to come. Watch this space for further announcements!